The term 'hand gun' seems an oxymoron when applied to a gun with a six-foot barrel, a bore of nearly an inch and heavy enough to require help holding its far end up. That was the musket when it first appeared in 1521 in the hands of the Spanish battling in Italy. 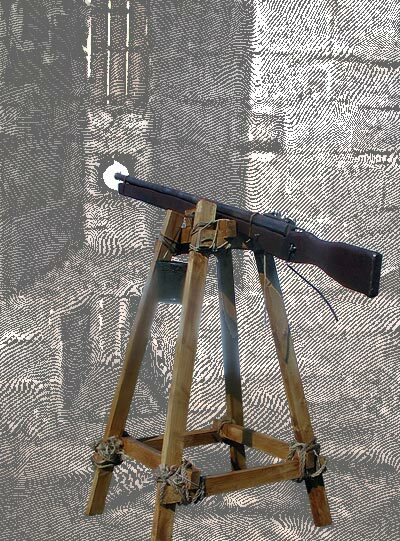 The very familiar musket began its long military career as a siege weapon. Used for that purpose, its weight and length were compensated for by its gunners not having to carry it far and usually shooting from fixed positions. Even heavier and larger bore guns were made, and had to be used with fixed supports as the illustration of the reproduction shows. Siege warfare favored the musket and its bigger brothers for their range and their hitting power as compared to the lighter arquebus, which had been used for decades. Of the musket Humphrey Barwick in 1591 said that a musket ball could pierce the best armor at 200 yards and lesser quality armor at 400, and strike down an unarmored man at 600. If good armor could be pierced by a musket ball at 200 yards, then a cavalryman could be felled from his horse at that distance. Paolo Giovio described about the Siege of Pavia in 1525 "...trained Spanish spraying on both sides volleys of deadly shot..." into French cavalry, with some musket balls penetrating two men at a shot or even two horses. Although acceptably accurate within 50 yards, going beyond, hitting what one aimed for was increasingly chancy. Recall that the Dutch preferred to have their fort bastions within 250 yards / 220 meters from each other - based on what they considered an effective musket range. So, at 400-600 yards, while a musket ball could travel that, striking the intended target was happenstance. Consider even at 400 yards, though, that several muskets firing over a period of time could have produced a level of concern among the enemy to have taken precautions to prevent being struck by the happenstance ball. For those deeply interested in the capabilities of the musket and other small arms of this period, Bert Hall, in chapter 5 of Weapons and Warfare in Renaissance Europe, indulges in excruciating detail and analyses. The musket's hitting power was so impressive that military men wanted it to augment the arquebus in field units. Its bulk remained a challenge, and men strong enough to heft their weapon were selected to be musketeers. The musket evolved, however, so that by the mid-17th century its barrel was shorter and the weapon was lighter, thereby alleviating the need for a rest under the end of the barrel. By then, it has also supplanted the arquebus as the firearm of issue for the foot soldier. With the drill of firing by files introduced in 1597 by the Dutch and volley fire debuted by the Swedes in 1631, it relegated the pike to a defensive support weapon. And body armor faded from use, being penetrable by the musket ball.